I’ve covered a few of swimming books a long time ago, two of the big books of our sport Kathy Watson’s The Crossing and Peggy Lee Dean’s Open Water Swimming and Bill Sweetenham’s Championship Swim Training. A few of the guys are excellent at covering open water swimming books, particularly Mark Robson‘s links of the classics of our sport and Evan recently had a great review of Wind, Waves and Sunburn. 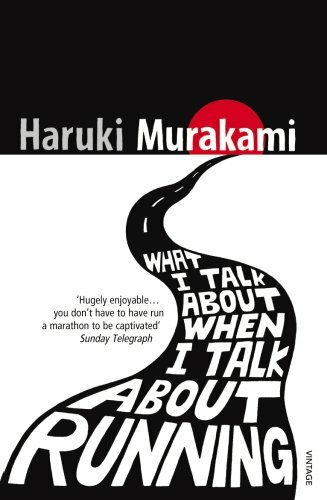 I’ve recently read and really enjoyed Haruki Murakami’s short What I Talk About When I Talk About Running. I’ve long had an interest in books about adventure and endurance and have found wisdom about swimming in many books in other areas. Murakami is Japan’s most famous and successful novelist and he’s been a marathon runner all his life. Anyone who has spent thirty years at endurance running is sure to have words of wisdom and being an author, just as important, they will be able to articulate something so many of us struggle with. It struck me immediately that in much of the book you could replace the word running with swimming and it perfectly would describe long distance swimming. Since I have an e-book version, it was easy to verify and display this hypothesis. I just converted the file type and replaced the words run, runner and running with swim, swimmer and swimming. One swimmer told of a mantra his older brother, also a swimmer, had taught him which he’s pondered ever since he began swimming. Here it is: Pain is inevitable. Suffering is optional. Say you’re swimming and you start to think, Man this hurts, I can’t take it anymore. The hurt part is an unavoidable reality, but whether or not you can stand any more is up to the swimmer himself. This pretty much sums up the most important aspect of marathon swimming. The author also has done some triathlons, so he actually talks about swimming a bit, but from the triathlon point of view, which may be of use to triathletes and beginning open water racers, (he talks about the full contact nature of open water racing), but there is an irony that when he is speaking about swimming it is of less interest to me. Murakami prefers marathons and the book is partly his writing life and how he finds running essential to maintain his energy levels for what he considers both a physically and mentally tough job, that of writing but it is also partly about training for a specific race, the New York Marathon. Of particular interest to me was his description, written just days after finishing of running a 64 mile Ultramarathon in Japan. I wrote my own English Channel description up pretty quickly, something now everyone does, and Finbarr recently mentioned in his guest article, the details fade. Writing my own account down was one of the most personally valuable things I’ve ever done, (and no it still hasn’t appeared on anywhere publicly) and have given me access to my feelings and memories, in the way that writing down a dream immediately after you wake gives you entry back into your dream state. I found a great convergence between Murakami’s description of his ultramarathon and my own English Channel. Once again I’ve changed runner to swimmer and changed the distance to the distance of my Channel swim. Either way, when I look back on that [swim] now I can see that it had a lot of meaning for me as a [swimmer]. I don’t know what sort of general significance swimming [forty] miles by yourself has, but as an action that deviates from the ordinary yet doesn’t violate basic values, you’d expect it to afford you a special sort of self-awareness. It should add a few new elements to your inventory in understanding who you are. And as a result, your view of your life, its colors and shape, should be transformed. More or less, for better or for worse, this happened to me, and I was transformed. I’ve used that word transformed myself previously, though I’ve used other words like redeemed also. The value of this book for any endurance athlete should be obvious. It’s short, concisely written and in a very clear and almost deceptively simple voice. I highly recommend it to distance swimmers because as we know the mechanics are less important than the mind. Knowledge of or interest in running is utterly unnecessary. I love this book. Two bits that chimed with me – firstly, he says that running is perfect for him because he doesn’t like sports where you have to decide things quickly; and secondly, that he doesn’t run in a void, but runs in order to acquire a void….a space to clear out his mind which in turn helps with his writing. Swimming for me is like running for him….I just wish it made my writing as beautiful as his! Very true Karen. 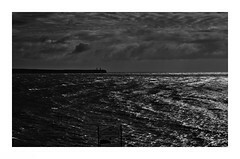 Reading it I was reminded also of a favourite Blaise Pascal quotation from a letter: “I apologise for the length of this, I did not have the time to make it shorter”. The concise nature of it shows an author very much in control of his message.